Garmin supply & manufacture innovative GPS technology across diverse markets including aviation, marine, fitness, outdoor recreation, tracking & mobile apps. They wished to install new automated conveyors to increase their distribution capacity and to provide more pick & packing space. This was to be carried out without having any impact on existing output. Garmin also required more shelving space and renewed live storage beds. 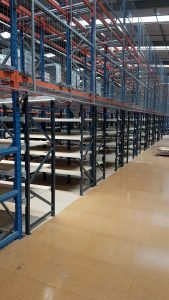 HMF provided the solution to their needs by designing & installing (outside of their working hours) a 1515m2 mezzanine floor and by converting some existing live storage racking into mezzanine floors with 100 bays of Longspan shelving installed into the racking structure. HMF also renewed 150 beds of live storage rollers. All of the installations were installed alongside Garmin’s normal operations so that they suffered no loss of production & output. undoubtedly have caused a big impact on Garmin UKs operation & created massive increased project costs. Close cooperation with Building Control allowed the structure to have sprinklers with no requirement for fire rating. HMF coordinated all the trades to ensure Garmin had a trouble free period whilst the installation progressed. 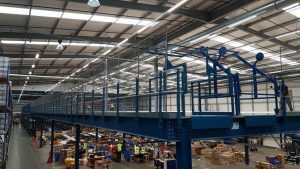 The new installation has allowed the client to install a new efficient conveyor system with high technology packing machines and created much needed additional storage thus allowing Garmin to meet increased demand. 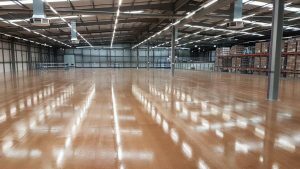 The mezzanine structure was completed ahead of schedule and the overall programme was on target and came in on budget.